Coupes and convertibles, part two | What Car? Why change a winning formula? The old 307 CCs blend of sporty styling and keen pricing has always appealed to buyers, and the new 308 CC is all about refining whats there rather than breaking the mould. 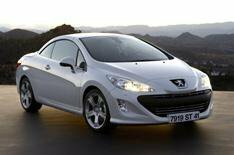 Like its predecessor, the 308 CC is a four-seater with an electrically folding hard top. This takes 20 seconds to rise quick enough to ensure you avoid a soaking from all but the most sudden of cloudbursts. Space for carrying luggage is greatly improved: with the roof up, there are 465 litres, 100 more than before; roof down, you get only an extra 50 litres, but that still gives you 266. Driver and passenger comfort is enhanced by a system that blows warm air through the front headrests to keep exposed necks warm. It means you can enjoy the delights of the wind in your hair all year round. There are some neat safety features, too, including a side head airbag system and roll-over bars that pop out in an accident, protecting occupants. When the car goes on sale in the spring, buyers will be able to choose between a 150bhp 1.6-litre petrol engine and a 140bhp 2.0 turbodiesel, although the range is likely to be expanded in time. Both units will link to a six-speed manual gearbox. Standard kit will include a built-in MP3/CD stereo, Bluetooth connectivity and sat-nav. Best news of all, though, is that the 308 CC is unlikely to break the bank: early indications suggest the open-topped car will cost only around 300 more than the equivalent hatchback. The only thing not new about the Ferrari California is the name, which was last used in the late 1950s. The rest is hot off the press and includes a number of firsts for the marque. Its the manufacturers first car with a folding metal roof, a front-mounted V8 engine, direct fuel injection and a twin-clutch semi-manual gearbox. 55g/km better than the mid-engined F430. The two-piece folding metal roof stores or unfurls in just 14 seconds and its compact construction means you lose only 100 of the 340 litres of boot space when its stashed. You can order the Californias cabin as either a two-seater or a 2+2. The new 370Z has a lot in common with the G37 Coupe that also arrives next year from Nissans upmarket Infiniti brand. Both use the same 320bhp 3.7-litre V6 engine, which develops 11bhp more than the unit in the 350Z that the 370Z is replacing. That should allow the new car to push its 0-60mph sprint time below the 5.5sec posted by the 350Z. The 370Z is also based on the same platform as the G37, and buyers will get the option of the same seven-speed automatic or a six-speed manual gearbox. Unlike the Infiniti, however, the new Nissan wont be a 2+2 coupe, but will stick with a two-seater layout. A roadster version of the 370Z, perhaps with a metal roof like that seen on the newly unveiled G37 Convertible, should arrive around a year after the coupe. Power comes from the GranTurismos 399bhp 4.2-litre V8. With the six-speed automatic gearbox fitted as standard, wed expect the Spyder to go from 0-60mph in under 5.5sec. The two-seaters interior will follow familiar Maserati lines, while its exterior styling has been helped along by top Italian design company Pininfarina. Renault is pitching the Laguna Coupe against rivals from Audi, BMW and Mercedes, saying it offers similar performance and refinement for considerably less money. It is cheaper, but our early tests suggest the driving experience and cabin refinement lag slightly behind those of some rivals. Buyers have a choice of four engines at launch: 147 and 176bhp 2.0-litre diesels, and 201bhp 2.0 and 235bhp 3.5 petrols. A 230bhp 3.0 diesel will be available early next year. Standard equipment includes 18-inch alloy wheels, MP3 CD player, eight airbags, automatic lights and wipers, climate control, rear parking sensors and xenon headlights. The Coupe GT trim adds four-wheel steering, an automatic parking brake, electrically folding door mirrors, leather upholstery and keyless entry. First Bentley with an official top speed of more than 200mph. The CTS Coupe should hit the UK next year with petrol and diesel options. Manually folded fabric roof should keep base model under 10,000. Only 350 of these cars will be built and just nine will arrive in the UK.